Nex Gen Science Standard: 3-PS2-3. Ask questions to determine cause and effect relationships of electric or magnetic interactions between two objects not in contact with each other. Today we are going to be talking about magnets. Some of you have used magnets and you have seen how they work. Magnets are objects that create a magnetic field. You cannot see the magnetic field, but it creates a force that can attract or repel other magnets. Attract means to come together. Repel means to push apart. 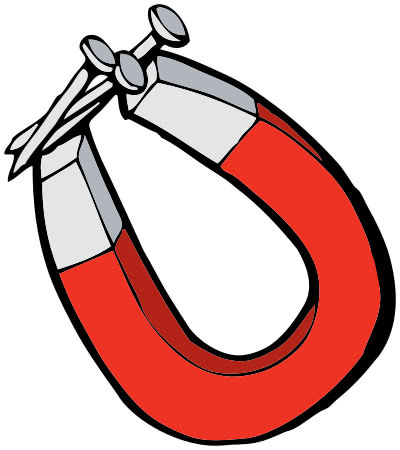 Magnets also attract to magnetic materials, like many metals. Magnets have two poles on either end. They have a north pole and a south pole. Opposite poles attract to each other. This means that the north pole of one magnet will attract to the south pole of another magnet. If you hold the north pole of one magnet up to the north pole of another magnet, it will repel. Magnets have different strengths. Strong magnets can attract to other magnets from a distance away. When this happens, it almost looks like the magnets are being pulled together. The magnetic field is what makes a magnet strong- the bigger the magnetic field, the stronger the magnet. You can tell how big the magnetic field of a magnet is by watching to see when it starts pulling another magnet or object toward it. When the object or other magnet starts moving toward the magnet, it has entered its magnetic field. Magnets are different from other forces. Magnets do not need anything pushing or pulling them to make them work! We just talked about how magnets work. Now, I am going to show you how magnets attract each other and repel other. You are going to watch what happens and then you are going to write down what you saw happen. You are then going to get a chance to experiment with the magnets. Hold the magnets up so that all of the students can see them. Hold the magnets at a short distance from each other so that they will attract to each other. Let the magnets come together. Then, turn the magnets so the other sides are facing each other. Try to get the magnets to come together (they should repel against each other). Allow time for the students to write down their observations and to experiment with the magnets. Kimbery is an educator with extensive experience in curriculum writing and developing instructional materials to align with Common Core State Standards and Bloom's Taxonomy.